New Delhi: ORIENT BLACKSWAN released the English translation of eminent lawyer and Gandhian Hamid Kureshi’s Gujarati book “Agnipariksha”. The book memoir of Hamid Kureshi’s experience during the 1969 Gujarat riots, has been translated by renowned cultural historian, writer and translator Rita Kothari. Agnipariksha recounts the experiences of an eminent Gujarat High Court lawyer Hamid Kureshi during the 1969 Ahmedabad riots when rioters attacked the Gandhi Ashram. Hamid Kureshi grew up in proximity to Gandhi in a family whose devotion to the nation, and to Gandhi, was absolute. During the riots, when perhaps for the first time, Kureshi—a third-generation Gandhian and a non-practising Muslim married to a Hindu woman—is reduced to being only a Muslim, he struggles to comprehend the hatred and rage directed at his community even as an entire legacy of Gandhian syncreticism stands challenged. In this matter-of-fact, restrained, yet poignant first-person account, Kureshi provides the landscape of a violence-ridden city, as also a glimpse into the many lives associated with the Gandhi Ashram. In an atmosphere of terrible fear and uncertainty, he recounts how his family’s struggles for self-preservation were buoyed by the constant shielding presence, concern and affection of Hindu friends and neighbours, and the Ashram community. This memoir is an assertion of human kindness, friendship and dignity amidst mortal danger, hatred and fear; and Kureshi’s narration, untouched by bitterness or resentment, leaves the reader moved. Agnipariksha is a valuable addition to Gujarati literature and a welcome companion to Gandhi and Peace Studies. This translation by Rita Kothari makes a rare document of a period, a city and inter-faith relationships accessible to a wider readership for the first time. The book launch was graced by distinguished guests Apoorvanand, Professor, Department of Hindi, University of Delhi; Ashis Nandy, Fellow, Centre for the Study of Developing Societies; Urvashi Butalia, Writer and Publisher; Ali Khan Mahmudabad, Assistant Professor of Political Science and History, Ashoka University. Hamid Kureshi (1927–2016), a Gujarat High Court advocate and Gandhian, was the chairman of the Sabarmati Ashram Preservation and Memorial Trust, Ahmedabad. He was the grandson of Abdul Kadir Bawazeer, a close friend and lifelong associate of M. K. Gandhi. He published Agnipariksha in 2003. Rita Kothari is Professor of English, Ashoka University, Sonepat, Haryana. A reputed theorist and practitioner of translation with numerous books and awards to her credit, she has also worked extensively on borders, partition and language politics in India. Her notable monographs include The Burden of Refuge: Partition Experiences of the Sindhis of Gujarat (2009); Memories and Movements: Borders and Communities in Banni, Kutch, Gujarat (2013); and Translating India: The Cultural Politics of India (2003). She has translated the first Dalit novel in Gujarati, The Stepchild (Oip) (2013) by Angaliyat, as well as poetry and short stories from Sindhi and Gujarati. She is currently editing A Multilingual Nation: Translation and Language Dynamics in India (forthcoming). 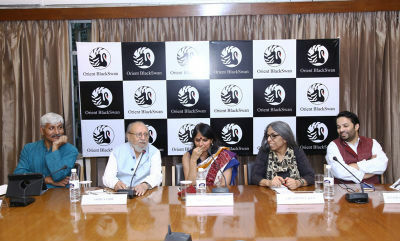 Orient BlackSwan is one of India’s best known and most respected academic publishing houses. Incorporated in 1948, the consistent emphasis of our publishing has been on quality. Our 13 offices coupled with a distribution network of over 1500 booksellers ensure easy availability of our books throughout India.